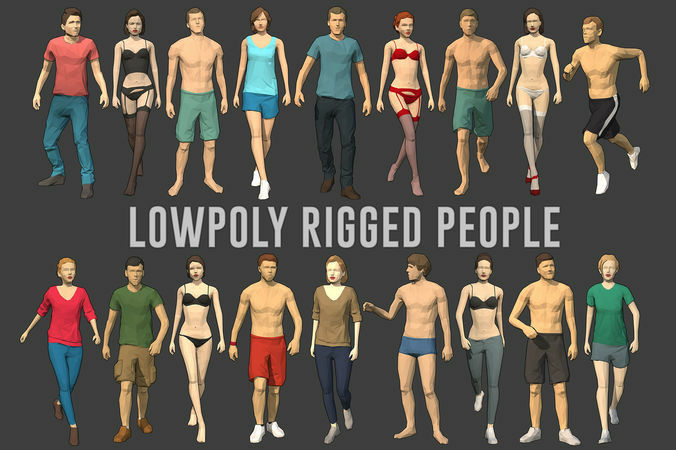 Lowpoly Rigged People contains a set of 20 rigged charaters in different outfits. More than 100 head/outfit combinations. Ready for architectural visualization, game engines (Unity3d, Unreal) and other graphical projects. Realistic proportions are achieved by a combination of high quality human scans, photogrammetric processing, mesh simplification and optimization. Stylized and creative, easy to use, tweak and animate. Customize a color by material ID or use a color scheme mapping. Rigged on standard Mixamo skeleton. Test animations included.